What Can a Disco Legend Teach Us About Brand Experience? A couple of weeks ago, I saw Nile Rodgers and The Chic Organization play the Love Supreme Festival in Glynde, East Sussex. I decided to go after watching their stand-out performance at Glastonbury on BBC3. I wasn’t disappointed. It was an amazing experience. 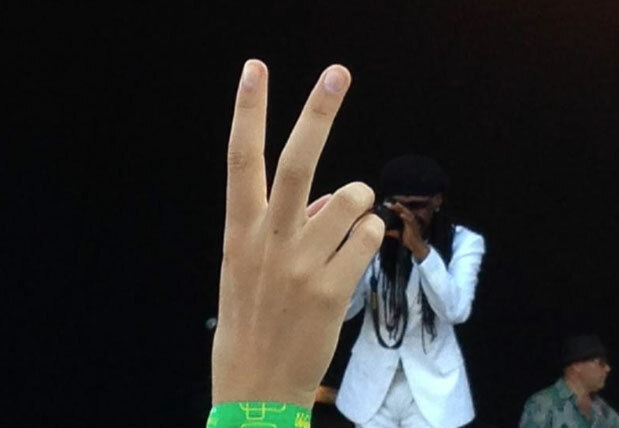 I think that creatives, geeks and anyone in business can learn a lot from Nile Rodgers. As a performer, writer and producer, in an unassuming way Nile Rodgers forms a significant part of the soundtrack to our lives. He’s re-defined how the electric guitar is played and how dance music is written. Niles and Bernard Edwards’ Chic were the pioneers of commercial disco music; their singles had great commercial success, and it’s interesting how he’s achieved this. He did not invent the funky rhythm guitar, but he did define how rhythm guitar could combine rhythmic groove with melody. Jimi Hendrix introduced this style (Voodoo Child) to rock music and there are many examples such as the funk icons of The Meters and Funkadelic. Niles’ genius is his adaptation of the complexity of jazz chord progressions to the structure of dance music combined with the simplicity and groove of 16th strums, divided into four strums per beat, with four beats fitting into each bar of music. You need great technique and timing to ensure metronomic up and down strokes and a crisp sound when the strings are supposed to ring and when they are supposed to be muffled. There are rules in guitar playing but Nile Rogers re-interpreted them by writing pop tunes based on jazz chord progressions. He didn’t do this as an intellectual exercise or as a desire to be clever, but to add some musical dissonance and keep himself stimulated. He dared to be different and it paid off. He explains this well at a workshop at the Montreux Jazz Festival. He also manages to write infectious hooks that are instantly recognisable within a bar or two. His tunes usually consist of three to four chords but are unmistakable. And this grabs your attention. Nile Rodgers and Pharell William’s co-wrote Daft Punk’s summer anthem ‘Get Lucky’. The hook consists of four chords which have became ‘the sound of the summer’ when it was still Spring! When I heard this tune for the first time I wondered whether Niles Rodgers was playing on it too. Again this is his genius. How many guitarists are instantly recognisable? Could anyone play it better? YouTube is littered with enthusiastic amateurs and teachers keen to demonstrate how to play it, but they don’t sound the same. Nile has been in the business for decades and it would have been easy for him to go through the motions. Quite the opposite. He made the audience feel special and the band were clearly enjoying the experience as much as the audience. Before playing, the band took out their Iphones and filmed the crowd (see picture above). They too wanted to treasure the experience. The band smiled throughout, their enthusiasm was infectious. Summer sunshine, cold cider, a beautiful setting, the company of good mates, a musical genius in action who cared about us. It all made for an unforgettable afternoon.